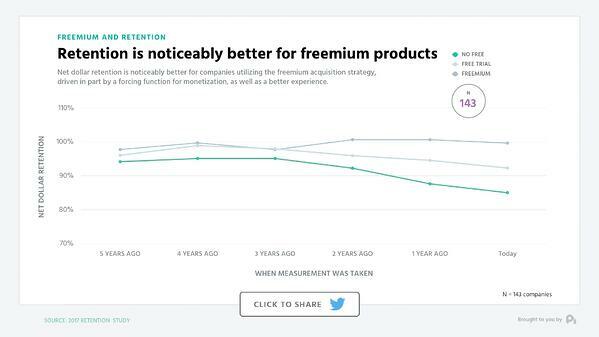 Freemium is an acquisition model, not a revenue model. 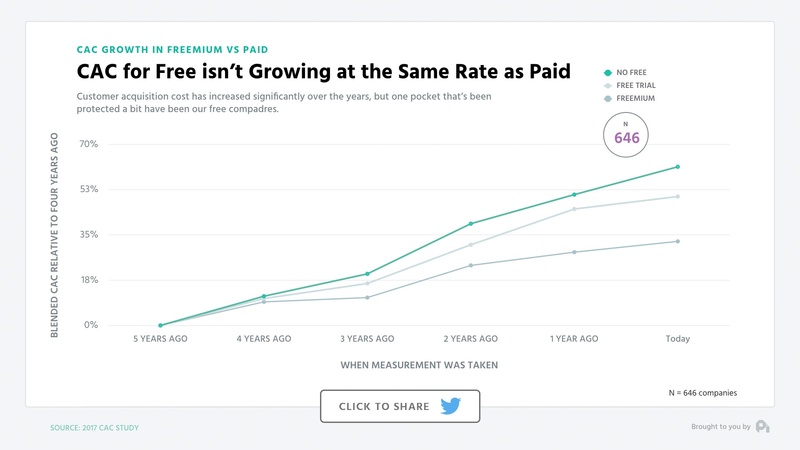 I’ve been saying this for the better part of a decade, because too many people think freemium will somehow unlock their pricing when in reality freemium is an extremely difficult path to widening the top of your funnel to a flood of prime leads. A free trial just won’t even come close to its effectiveness when done right. On this episode of the ProfitWell Report, Dhruv Patel, Co-Founder at SalesHandy, asks us to look at whether a freemium model or free trial model is the right way to go. I guess I just in a pretty opinionated manner answered the question, so let’s get the data to support that notion and answer Dhruv’s question by looking at 1.5 thousand companies and nearly 55 thousand subscription consumers. The core difference between a freemium and free trial play is time. Under a freemium guise, no matter if the free plan limits features or usage, that customer theoretically can be nurtured forever. 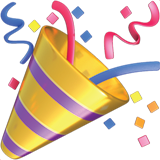 Every month they can use the free features or up to the free amount that you’re limiting. Free trial on the other hand, is time boxed. You can only use the product in whatever manner is allowed for a set period of time. 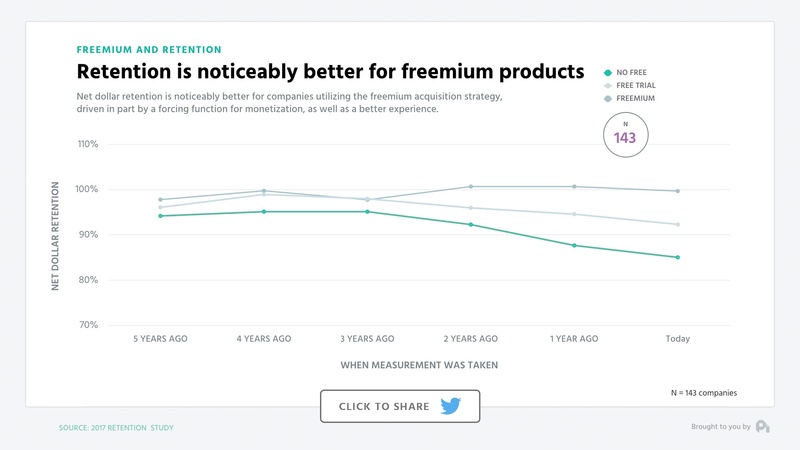 Allowing the freemium customer to nurture for however long they need pays off when it comes to retention, with those individuals who converted from a freemium plan having nearly 10% better net retention on an absolute basis than their free trial counterparts. Note though that those on free trials have nearly 10% better retention than those who aren’t using either free play. 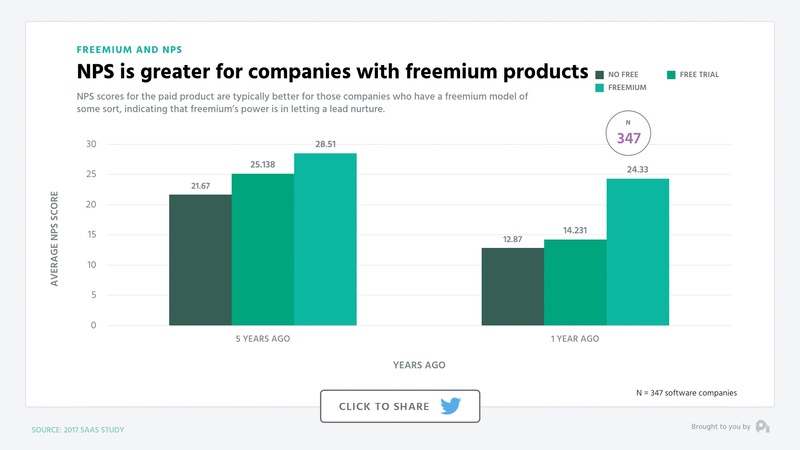 NPS follows a more distinctive trend in this vein, with those customers converting from freemium seeing 70% higher NPS than those from a free trial who essentially have the same NPS as customers who converted without a free trial or freemium. OGs of the subscription world are probably yelling at me through the screen right now about how freemium cheapens your brand and actually increases your customer acquisition cost. Yet, CAC is actually trending upward on all fronts, but note that freemium CAC is nearly 15% on an absolute basis lower than free trial CAC, which trends much closer to companies not deploying either strategy. On a brand basis, the OGs may have a bit of a point, but what you may have noticed on all the cuts of data is that the trends I'm pointing out have been mainly solidifying in the past couple of years. This is because we as consumers are only recently starting to get over any preconceived notions of free. 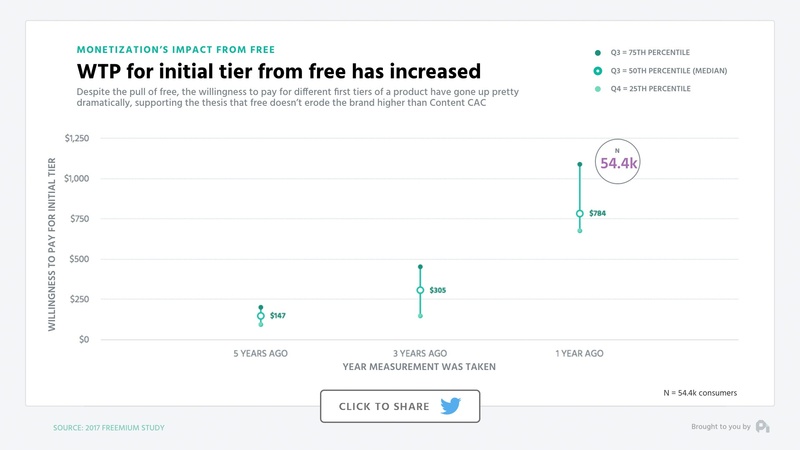 Free is becoming part of the average experience and you’ll notice that the threshold for willingness to pay for a customer from a free plan to a paid plan has risen over time to customers being more than willing to pay for a four figure MRR product right from a free plan, which is up from $150 five years ago. 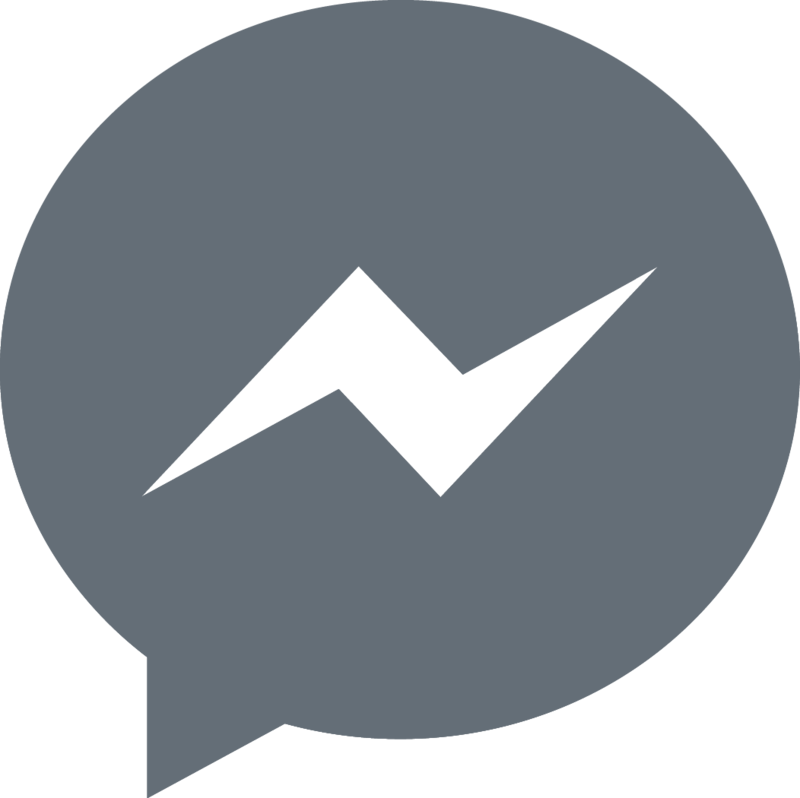 Essentially, as products become easier and easier to build and customers get harder and harder to acquire, you need a way to lower the activation energy of a customer converting and the ability to nurture them over time. Freemium does this perfectly, and we will live in a world where every company is deploying some sort of a free strategy, just like every company now has some sort of an ebook and unlike a free trial, freemium lets a customer experience your brand, your product, and your ethos on their terms instead of forcing an ultimatum. Well, that's all for now. If you have a question, ship me an email or video to pc@profitwell.com and let's also thank Dhruv for sparking this research by clicking the link below to share and give him a shoutout. We’ll see you next week.